Question: What is NULL Value in MySQL? NULL values means don't have any value. It is neither empty NOR it have any value. Question: Give an Example which is give NULL Values in Query? NULL values means don't have any value. It is neither empty NOR it have any values. Question: How we can replace the null value with empty string? 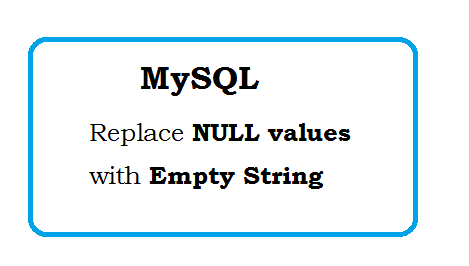 Question: Give an Example to replace the NULL with empty string in mysql query?